One of the things we've learned at the paper since putting the grill on the back porch is that there are few things that aren't improved with a kiss from an open flame. Fruit is no exception. Unlike vegetables, meat or poultry, which run the risk of burning because they have to fully cook, fresh fruit is a perfect grilling item because it only needs a little heat to be considered "done." That small brush of heat, and a whisper of smoke, can take a plain peach and make even the pickiest eaters salute it. From May 19 through Sept. 15, 2008, you can enter to win the "Fresh Grill Thrill" Sweepstakes. Two grand prizes include a brand new Char-Broil RED three-burner grill (retail value of $599 each), and six first prizes include a Char-Broil Designer Series stainless steel grill (retail value of $259 each). More than 50 additional prizes will be awarded. "With grilling season upon us, we want to help consumers liven up what they are preparing this summer with fresh and fun ideas for grilling fruit," said Dionysios Christou, Del Monte Fresh Produce vice president of marketing. "Men and women alike enjoy grilling, and research shows people are increasingly using grills to create fast, healthy meals." Tips for grilling fruit, include: first use high heat for a few minutes, then lower the heat to create great grill marks; grill fruit for short time periods only; drizzle fruit with sugar to bring out the natural sweetness; apply a thin coat of oil to the grill before grilling; cut fruit in half and remove the core for grilling; grill bananas with entire peel on grill fruit pulp-side-down first, then turn onto the peel to finish. 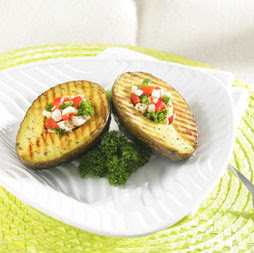 Also essential to excellent grilled fruit, however, is a great grill, Christou said. This year, Char-Broil introduced Char-Broil Red, a new infrared grill that delivers superior taste, simplicity and efficiency. Char-Broil Red is the sweepstakes grand prize and features a stylish front red panel and a new U-shaped infrared emitter, which evenly distributes 100 percent infrared heat and eliminates hot or cold spots on the grill. It also increases energy efficiency, both in the amount of propane used and in personal time savings. Here are some recipe suggestions from Del Monte and Char-Broil. 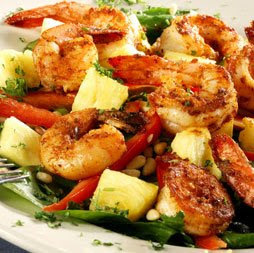 More (the shrimp and pineapple pictured above, for instance), are available online. Rub lemon juice on the surface of the avocado halves. Let sit for 10 minutes. Season the avocado halves with salt and pepper. Brush with additional olive oil. Grill avocado halves flesh side down over high heat for several minutes. Once the flesh has deep grill marks, turn halves over, reduce heat to low and continue cooking for another 4-5 minutes. The avocados are done with they are hot and soft all the way through.Place each avocado half on a plate. Mound the tomato/red pepper/feta mixture on top of the avocados and serve immediately. Grill the pears over moderately high heat by placing them flesh side down on the grill. Once the flesh has nice grill marks (2-3 minutes), turn the pears onto the skin side and continue grilling until the pears are heated through (4-5 minutes). It may be necessary to lower the heat if they start to scorch. Grill the red onion slices over moderately high heat until they have nice grill marks and have started to soften (4-5 minutes).While the red onion and pears are still hot, transfer to a cutting board and dice. 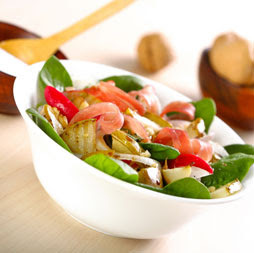 Toss warm red onion and pear with spinach, radicchio, walnut pieces, green onions, balsamic vinegar salad dressing, and black pepper.Arrange salad on individual plates and top with prosciutto. (If serving the salad in a large bowl, simply top the whole salad with prosciutto.) Serve immediately. he bananas will only take a few minutes to heat through. If they are very ripe, they will cook very quickly. Remove bananas from heat and cut each banana into 3 pieces on the bias. 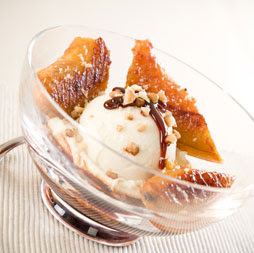 Scoop ice cream into bowls. Top each with 3 pieces of banana. Spoon warmed brown sugar mixture over the top. Finish with a sprinkle of pecans.